How do you feel about hard cider? While local distilleries have been getting a lot of notice lately, what’s been trending is the move to local cideries. Cider makers and drinkers will tell you that cider is a preferred beverage because, like wine, it has infinite possibilities, depending on the type of apples used, the fermenting and aging processes, but with a lower alcohol content (allowing you to drink more of it). The more I get exposed to the great cider that is being made here in the Hudson Valley, the more I’m liking it and looking for it on restaurant menus. I got to sample several different local ciders at a dinner at Angry Orchard. 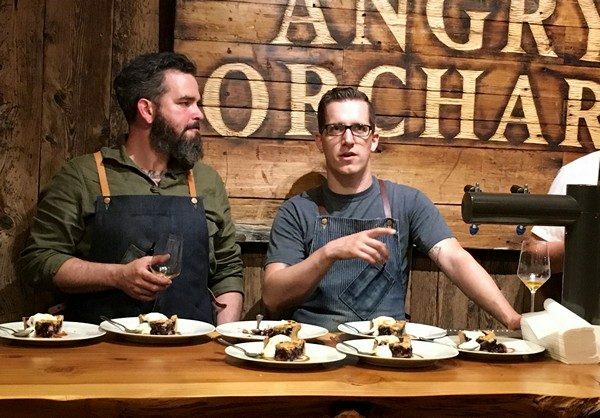 The dinner featured 7 of Angry Orchard’s ciders paired with dishes prepared for the event by visiting chef James Rigato from Mabel Gray Kitchen in Michigan. Impact PR and Communications had invited me as their guest. Angry Orchard would be worth the visit, even without a great dinner. 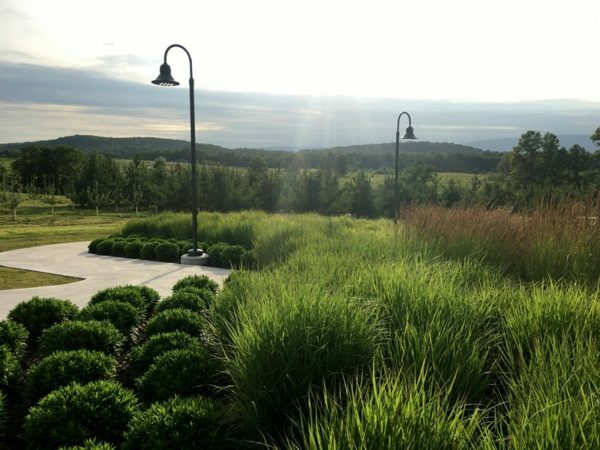 It’s perched on a hilltop in Walden New York, with views out towards the Shawangunk Mountains. Everything is pristine, from the driveway to the picture-perfect barns holding the cidery and the treehouse featured on Treehouse Masters. We started out with a glass of their rosé cider, Rose for Sal. It was delicious, the perfect aperitif for a summer evening. 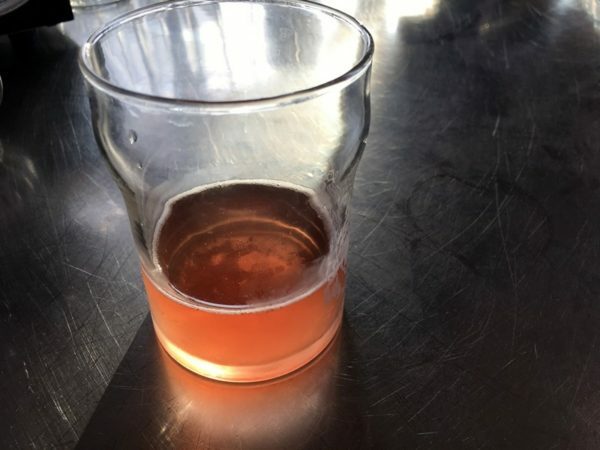 As we sat down, Ryan Burk, the head cider maker, talked about how he came to know Chef Rigato and introduced the first cider we’d be tasting, Newtown Pippin, a single variety, unfiltered cider made to showcase the complexity of the apple. 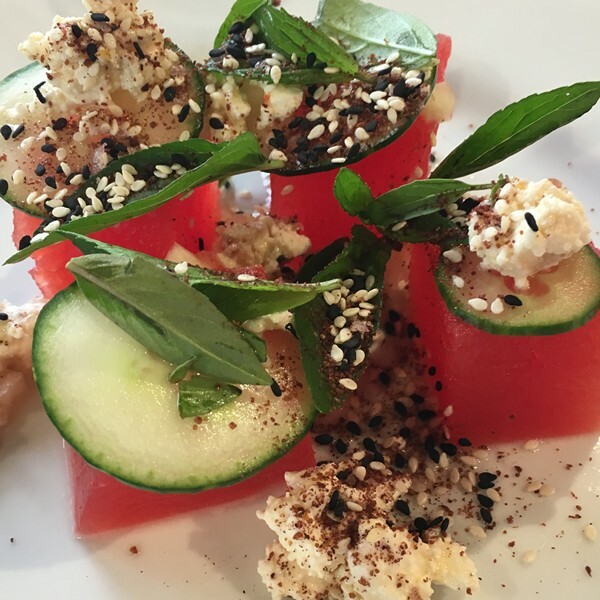 It was light and crisp, and a perfect counterpart to the first course—compressed watermelon (more about that later*) with marinated feta, mint and za’atar. It was a great version of a summer staple, delicious and refreshing. 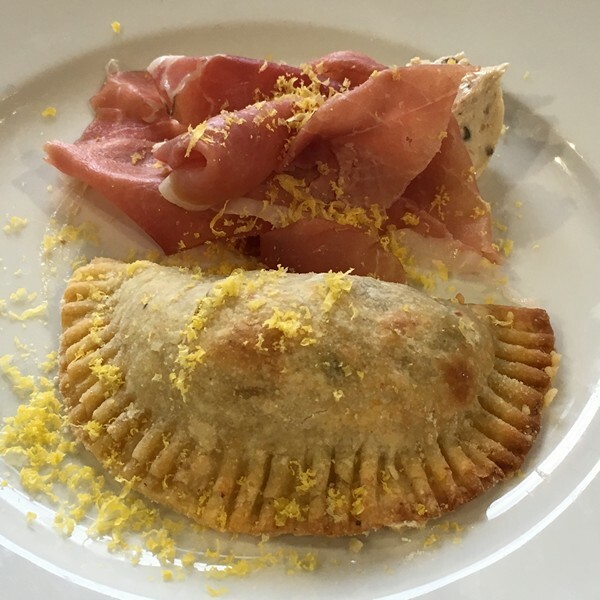 That was followed by a rapini and cheddar hand pie (think empanada) with country ham and an anchovy butter. The cider for the course, Understood in Motion, vintage 2016, was a collaboration with Eden Specialty Ciders and aged in Calvados barrels for 6 months. After that, Ryan asked us all to grab a tumbler from the bar and follow him out to the terrace. 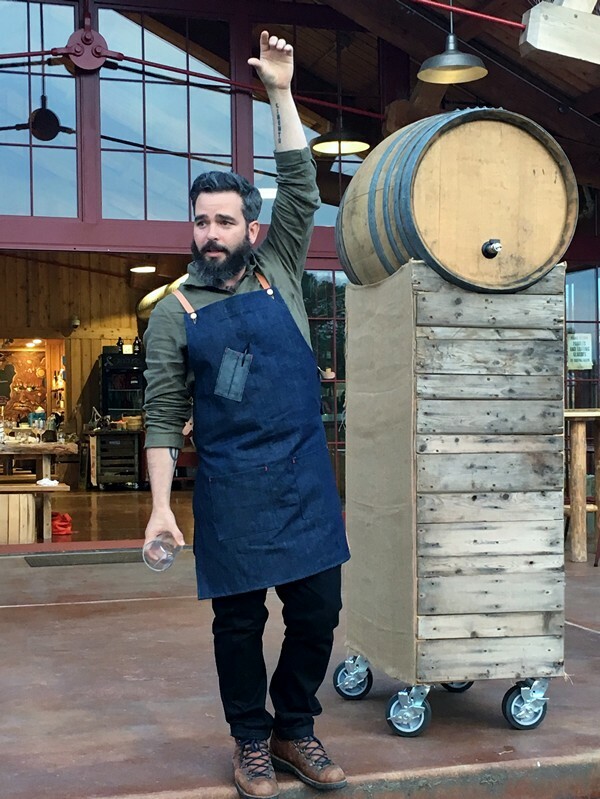 There he unveiled a barrel, newly mounted on a stand, holding the first tasting of Edu, his ode to Spanish sidra. The tradition is to pour about 2 fingers’ worth into a tumbler from a height to oxidize it and give it a “false” carbonation. We all got our chance to pour our own from the barrel and you could quickly tell who the experienced travelers/cider aficionados were. Back inside, the Edu went beautifully with one of my favorite courses of the night, Manila clams with a Thai green curry broth. 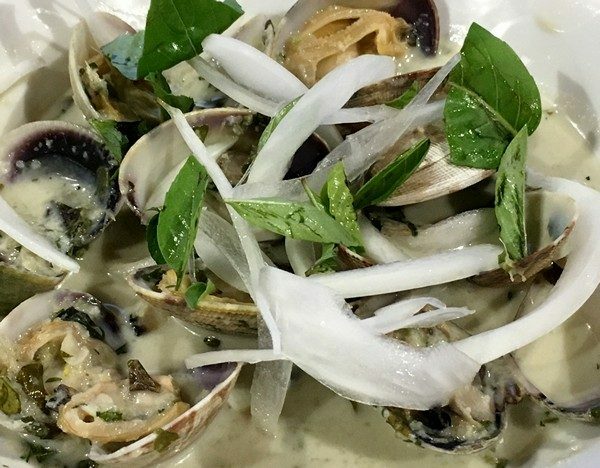 While mussels are often paired with Thai curries, this was my first time having clams in green curry and they were terrific! The cider did a great job of taming the heat from the clams. Oval Nouveau was the cider for an interesting dish featuring green apples dipped in kimchi and served with dollops of yogurt and candied cashews. It’s fermented in French oak barrels and then aged for 7 months. 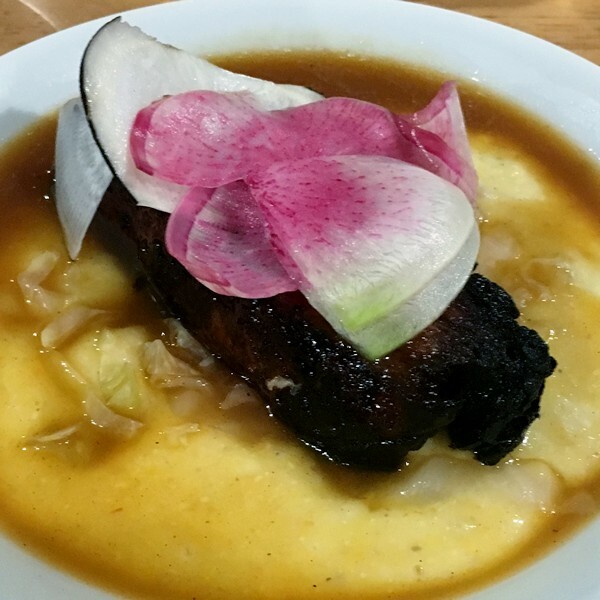 Our main course was a braised pork belly resting on a bed of cheese grits with homemade sauerkraut and a radish salad. The pork and grits were rich and tasty and the sauerkraut gave a nice tartness to balance out the dish. Understood in Motion, this one from 2015, was a collaboration with E.Z. Orchards in Oregon and fermented in oak was the very drinkable cider that was paired with the pork. Before dessert, we were instructed to fill our glasses with the final cider, Wooden Sleeper, a bourbon barrel-aged cider, and take a walk. We were led into the aging barn lined with wooden barrels containing all the various ciders. After that, it was up to the tree house for dessert, blueberry linzer tart with ginger whipped sour cream and a maple cider honey. Everyone was saying how good it was, but since it had hazelnuts in the crust, we’ll just have to take their word on it. The Wooden Sleeper was a lovely finish to the evening’s ciders and along with the Rose for Sal, one of my two favorites. 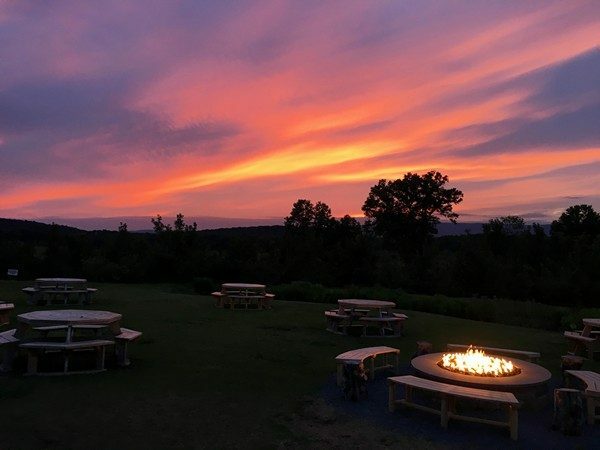 The ciders at Angry Orchard are constantly changing and evolving, so what we had at the dinner might not be available (but something wonderful will probably have taken its place). Ryan is constantly moving forward with the ciders, so make plans to visit the cidery and taste what’s new and interesting. *The secret, Chef Rigato told me, is to cut a big slab of watermelon and vacuum seal it. Going to give it a try and I’ll let you know how it works. Previous post: How Do You Save Recipes?